Berkeley, CA â€“ 13 July 2011 â€“ If you picked up the first issue of Jonathan Hickman’s new Image miniseries THE RED WING at your local comic shop today and you’re already hungry for more, you’re in luck: Hickman has announced that the first installment of his multi-part PLUS! project, FELL BETTER NOW, will be released this October. The PLUS! titles will each be published as stand alone novellas, all of which highlight Hickman’s return to the page as an artist, but each have a distinct style of their own. 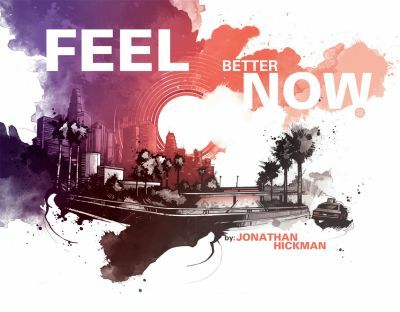 A creator who is always challenging himself and the medium, Hickman has said the dark comedy FEEL BETTER NOW is already the most interesting visual work he has ever created. Hickman began his comics career at Image Comics in 2006 with THE NIGHTLY NEWS, a visionary six-issue miniseries that upped comics’ game through its inventive design and smart, subversive storytelling. After such an astounding debut, Hickman only picked up the pace, turning out one quality title after another, including PAX ROMANA, TRANSHUMAN (with artist J.M. Ringuet) and THE RED MASS FOR MARS (with artist Ryan Bodenheim). Hickman is also the writer behind several popular Marvel titles, including Fantastic Four and S.H.I.E.L.D. FEEL BETTER NOW is the story of a group of psychiatrists who, out of boredom, decide to start recreationally tinker with the lives of their patients. It becomes a game, and, as one might guess, it spirals out of control pretty quickly. FEEL BETTER NOW, a 40-page original graphic novella, will be available to order in the August issue of Previews, and goes on sale in stores on October 19th for $3.99.